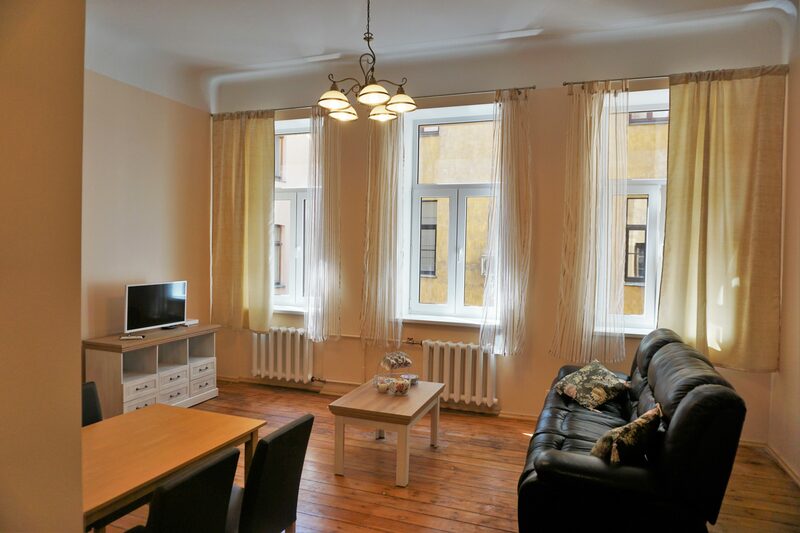 Regardless of whether you want extra privacy during your stay in Riga, are arriving with your friends, partner or family, in these apartments you can feel as relaxed as at home! Fully focus on your Russian language study abroad course and enjoy the comfortable stay! 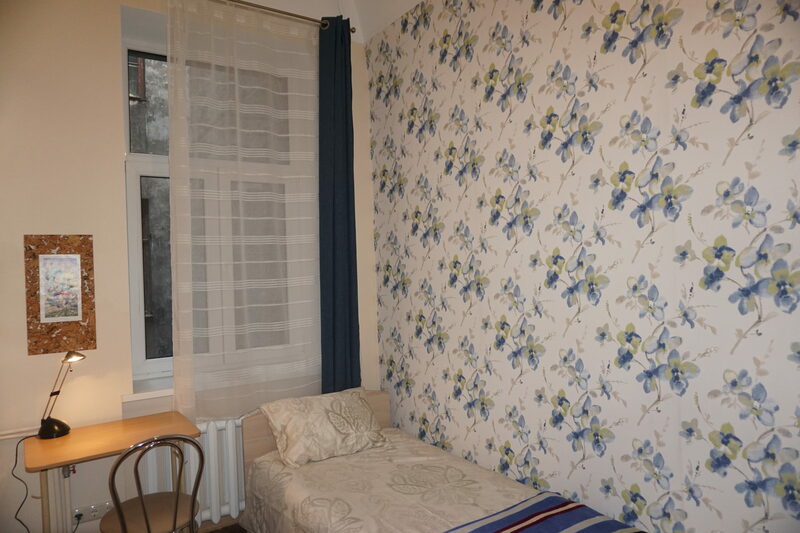 You will find the apartments in the very centre of Riga, in the same building as Russian Language Academy Durbe. All major tourist attractions are just around the corner! Across the street there is the National Opera House with the historic Old Town just across the park. The Central Train and Bus Station are 2 minutes away. Numerous cafes, restaurants and shops are at your service in just a few minutes walking distance. This apartment has two comfortable single en-suite rooms with a shared kitchen. Each room is fully equipped for your comfort. 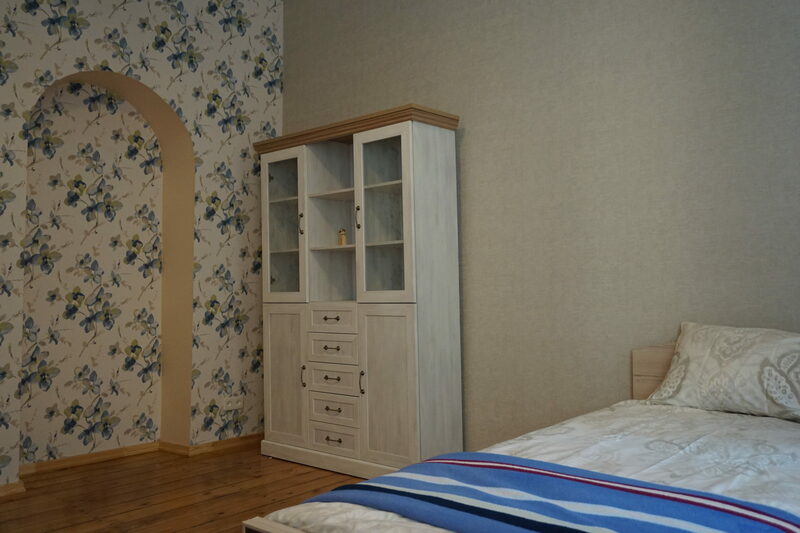 There is a single bed, a table with a chair and a storage place for your belongings. In the bathroom there is a shower, a sink, and a WC. 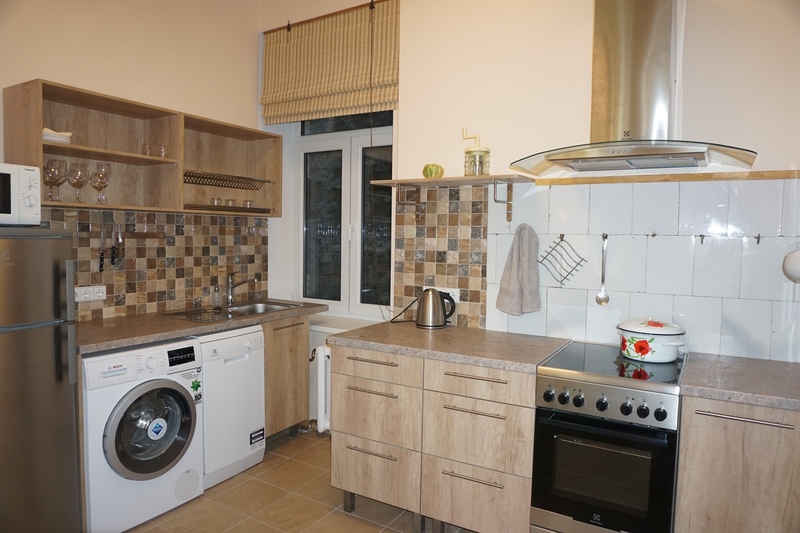 The kitchen is spacious and provides everything you might need during your stay in Riga. There is a spacious refrigerator, an electric stove, a microwave, a kettle and various tableware. Additionally, there is a washing machine with a drying frame. Weekly cleaning, towels and bed linen are included, and you can also request an extra cleaning service for an extra fee. In addition, there is a TV set and high-speed Wi-Fi available. Enjoy surfing the internet, reading the news and staying in touch with your friends and relatives to inform them about your language trip! The second apartment consists of 3 rooms sharing a kitchen. There is an en-suite single room and two more rooms – a single bed in one and a double bed in the other, with shared facilities. All rooms are very cozy with high ceilings, with a gentle spirit of 19th-century architecture’s atmosphere. In your room you will find a comfortable bed, a table, a chair, and a storage place for your belongings. The spacious double room has a big cosy bed for two people and is an ideal option for a travelling couple. In addition, there is a spacious common living room with everything you may need for a relaxing stay: a sofa, armchairs, a TV set with a free Wi-Fi. Both bathrooms (en-suite and shared) have a shower, a sink, and a WC. There is also a washing machine with a dryer for your use. Weekly cleaning, towels and bed linen are included, and you can also request an extra cleaning service for an extra fee. The kitchen is also well equipped with everything necessary: you’ll find a spacious refrigerator, an electric stove, a kettle and various tableware. 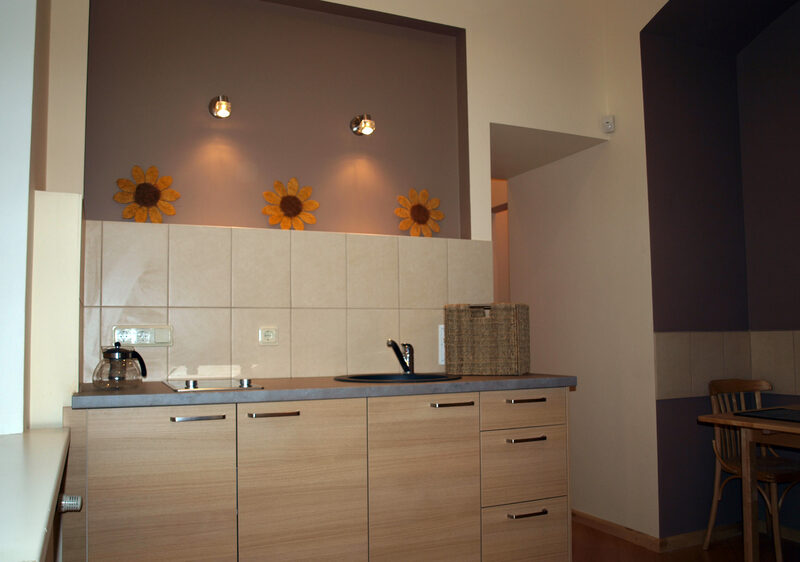 2) Double room for individual use, self-catering: 485 EUR in low season, 510 EUR in high season. 3) Double room + Single room for individual use, self-catering: 510 EUR in low season, 575 EUR in high season. 4) Double room + 2 Single room for individual use, self-catering: 540 EUR in low season, 645 EUR in high season. 1) Arrival transfer and chosen accommodation. 2) Arrival for each additional person (any non-student occupant) – 40 EUR. 3) Extra cleaning service: 30 EUR for double room, living room, kitchen, WC and shower, plus 10 EUR for every additional room. The security deposit of 400 EUR to be paid at least 5 days before your arrival. For an easy process, you will receive a secure payment link to make an online payment with a credit card (please make sure you have valid Visa or Mastercard). The deposit you will receive back to your card within 5 working days after your departure, when there are no damages left in the accommodation premises after the inspection. Standard accommodation length is from Sunday to Sunday. For a complimentary arrival transfer from Riga International Airport please book your flight between 12:00 and 22:00 for Sunday. For late arrivals transfer fee of 40 EUR applies. Please note that you should schedule your departure for Sunday before 12:00 PM. If you wish to arrive earlier or depart later than Sunday, the extra night costs a full week’s rate. 1) The flat has central city heating, as well as hot and cold water. Therefore please pay attention that Russian Language Academy Durbe is not responsible and does not compensate expenses in case the water/heating is turned off by the house-manager due to technical reasons. 2) Minimum age required for this accommodation option is 18 y/o. 3) Smoking is strictly prohibited.